May 5-9 is Teacher Appreciation Week! As a teacher, I always appreciate any gift that I receive from my students. Honestly, it makes me feel absolutely wonderful! LOL. I teach high school students, so I take what I can get. 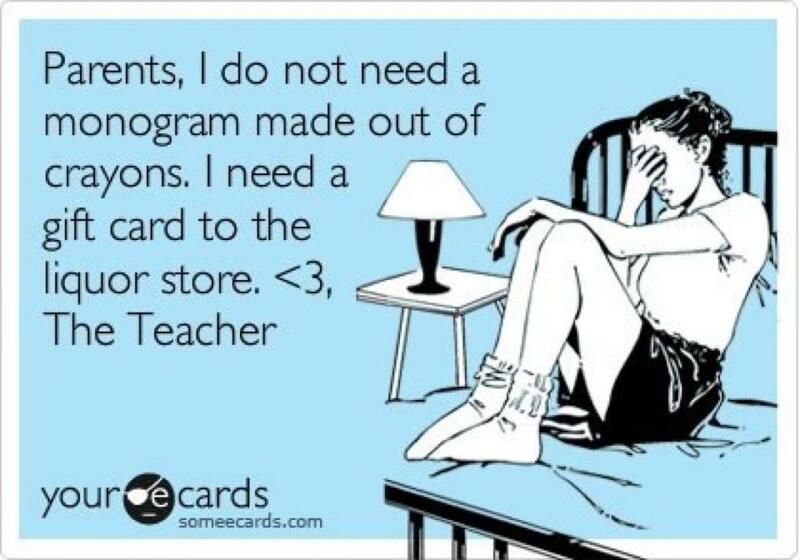 I know it can be hard to figure out what to give your child’s teacher (I have 3 kids which means 3 teachers). However, the best advice I can give is to ask your child what his/her teacher likes. Trust me, these kids know so much about their teachers! 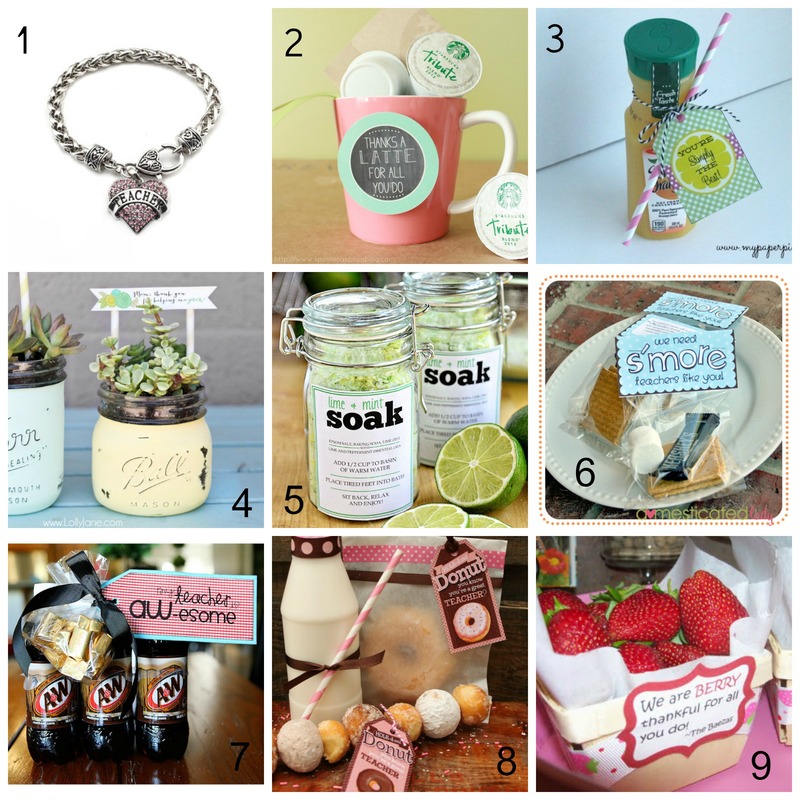 If you’re still not sure what to get her, I compiled a list of some of my favorite DIY gifts for teachers. We need S’MORE teachers like you! DONUT you know you’re a great teacher? I couldn’t resist adding this picture! 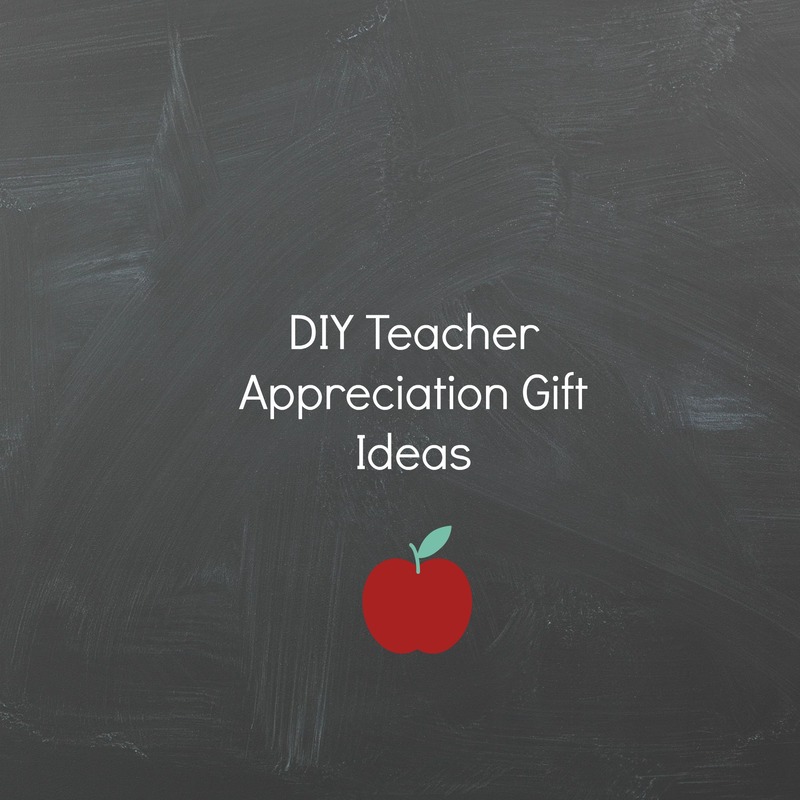 This entry was posted in DIY Projects and tagged diy, gift ideas, teacher appreciation. One of my favorite activities from my craft party was the Sharpie mugs. These mugs are a great way to show your creative side. If you’re not so creative, it’s okay! You can just write something cute or clever. One of my favorites is “I drink coffee for your protection!” HAHA! Once you’re satisfied with your design, bake your mug for 30 minutes. Allow your mug to cool. Use your mug for your favorite coffee or tea! 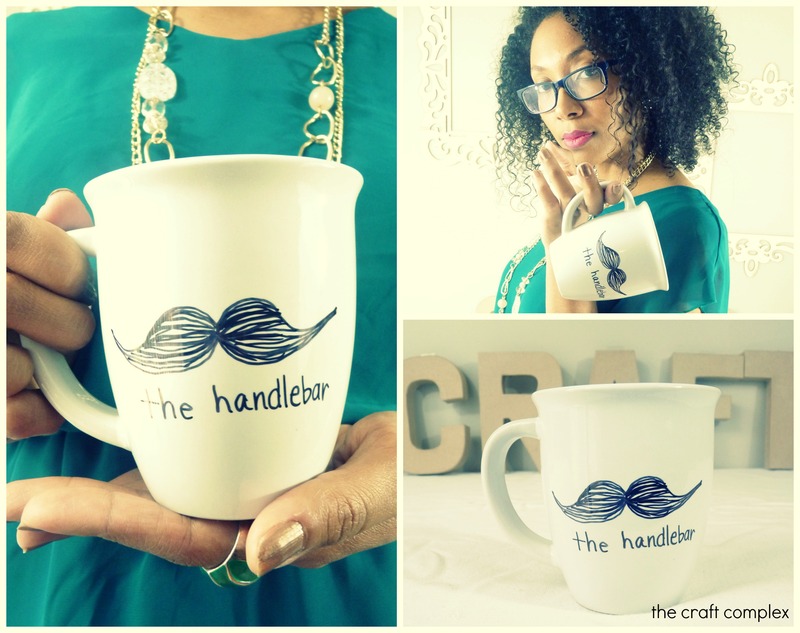 This entry was posted in DIY Projects and tagged diy, mug, mustache, sharpie, tutorial. Easter is right around the corner. If your kids are anything like mine, decorating eggs are a must! I’ve scoured the internet for some of the coolest egg decorating ideas. This entry was posted in Uncategorized and tagged decorating, dye, easter eggs, ideas, minion, ombre. I had my first craft party last night (more on that later) and it was so awesome! I gave all of the ladies these cute teacup candles. They are so easy to make and are the perfect gift. I’m thinking they would make cute favors for a bridal shower or even as decoration at a wedding reception. Now one thing about these candles…I made them from candles I already had on hand! Using old candles that you have already, coarsely chop them. On low heat, slowly melt the candles. I found a sugar cookie candle melt from the Dollar tree that I added in for a scent. It smelled wonderful! 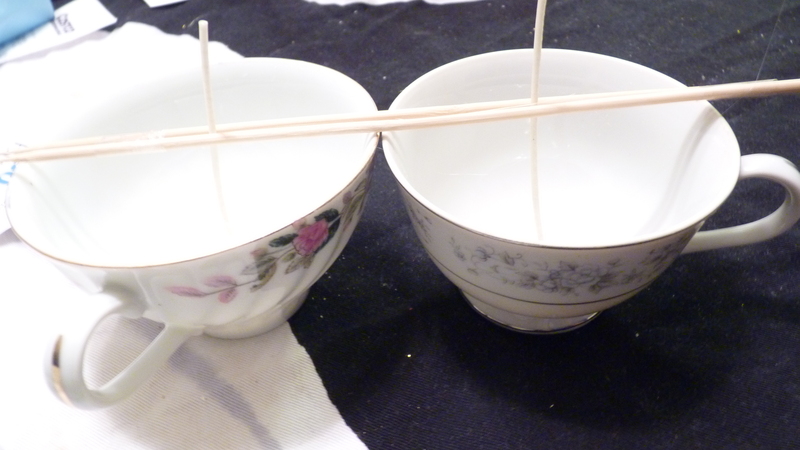 While your candles are melting, tape/hot glue the wick to the teacup. Tape your 2 bamboo skewers together at both ends. This will help the wick to stand up straight. Once your candles have completely melted, slowly pour the wax into your teacup. Allow the wax to firm up completely. I let mine sit overnight. Remove the bamboo skewers and cut the wick to desired length. 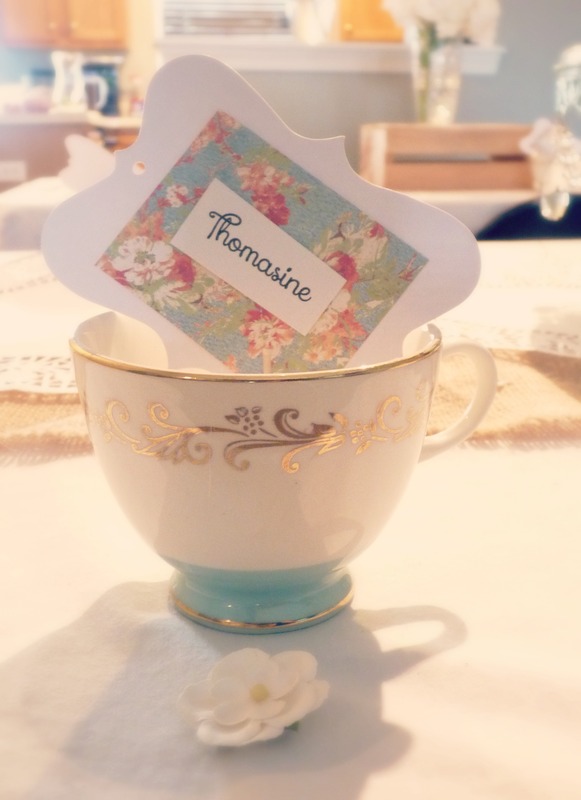 This entry was posted in Uncategorized and tagged candles, diy, goodwill, teacup, tutorial, vintage. Are you a page folder? I am! I just can’t help it. Whenever I have a bookmark, I lose it. Unfortunately, I’ve passed this trait on to my oldest daughter. She is an avid reader and a cronic page folder. These bookmarks are a perfect way to keep up with your page and the bookmark! You’ll need paper clips, buttons, felt, and a glue gun. Glue the paper clip to the back of the button. Cut a small square of the felt and glue it over the back of the paper clip. This will help to secure the paper clip to the button. That’s it. In less than 1 minute, I made three of these bookmarks. 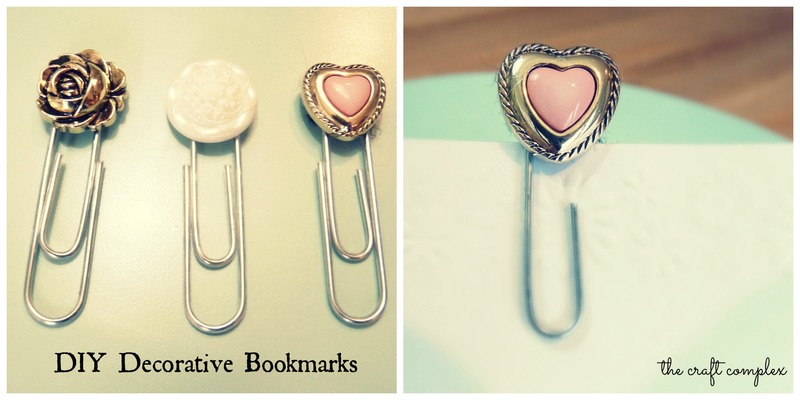 If you’re not a reader, these bookmarks can just be very fancy paper clips. 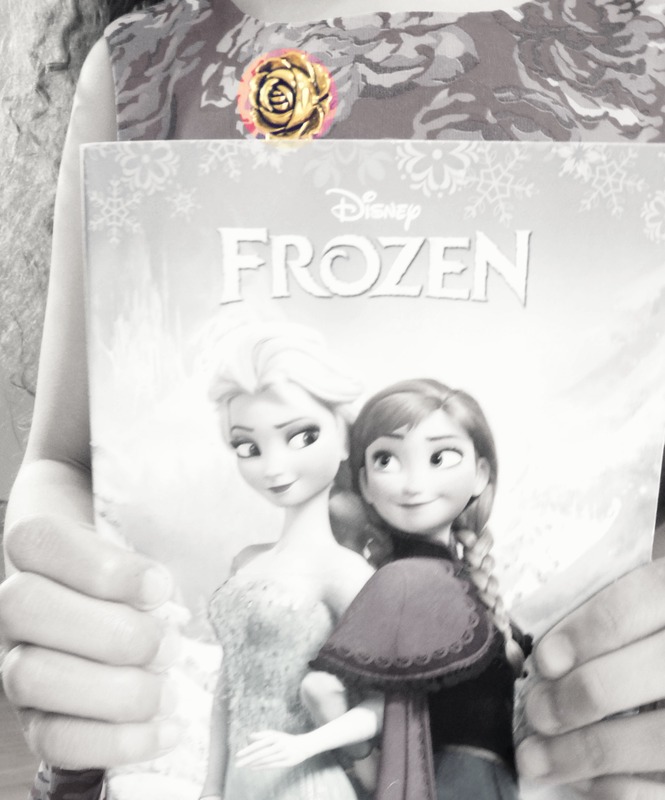 Of course she’s reading Frozen and had to take a picture with her book and favorite bookmark. 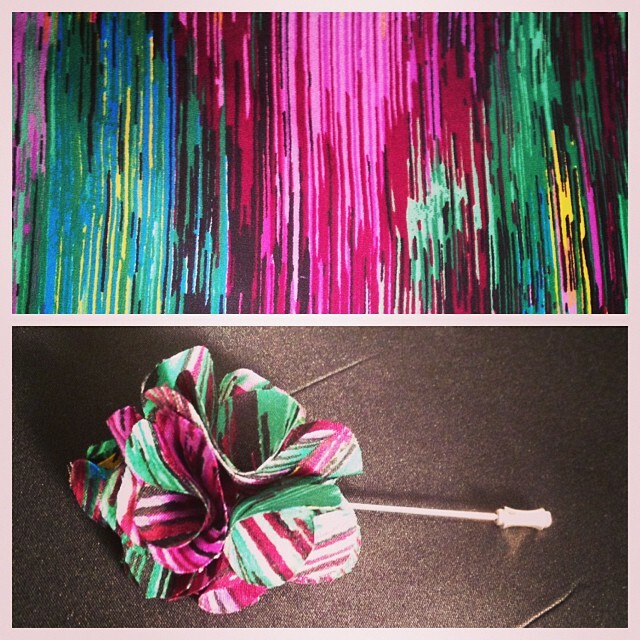 This entry was posted in DIY Projects and tagged bookmark, button, diy, paper clip. Need a way to freshen up your bulletin board? 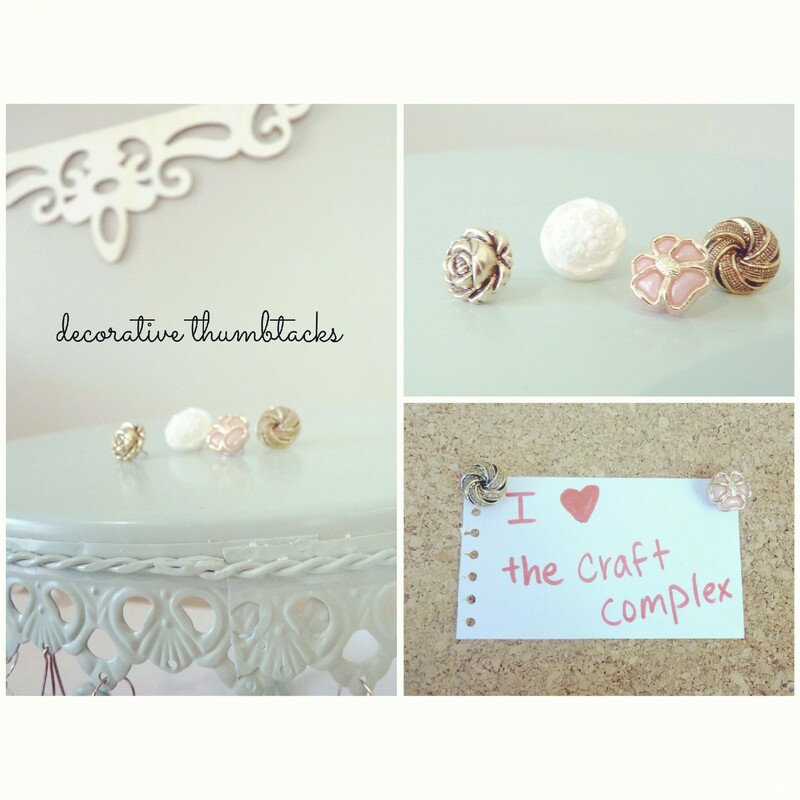 These decorative thumbtacks are exactly what you need! The best thing about them is that you can make them using knick knacks from around your house. I made mine using left over buttons. Plus, they’re so simple to create and take no time at all. Simply glue the thumbtack to the back of your button. That’s it! I would love to see how you decorate using these thumbtacks. This entry was posted in Uncategorized and tagged cork board, decorative, diy, thumbtacks. I have always had a unique fashion sense and have always been at the forefront of setting trends. I decided to step out about 8 months ago and create something to add an extra flair to the suited gentleman. There are various places I glean inspirations from. Whether it comes from colors, fabrics or a particular mood, I can become inspired. Building a certain style can bring forth inspiration. What is your current crafting obsession? Different fabrics/textures. For instance, buttons, pins, and industrial pieces. What are your future plans for your crafts? I am currently working on a website where people can purchase Finished Goods. Also, I am in the process of unveiling a Spring/Summer promotion of lapel flowers. Didn’t I tell you that he was creative? 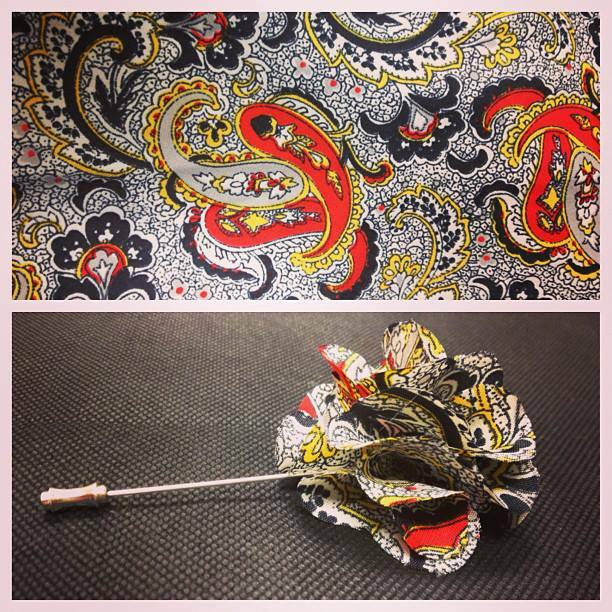 I absolutely love these lapel flowers. My favorite has to be the ‘stash lapel. It’s trendy and super cute. 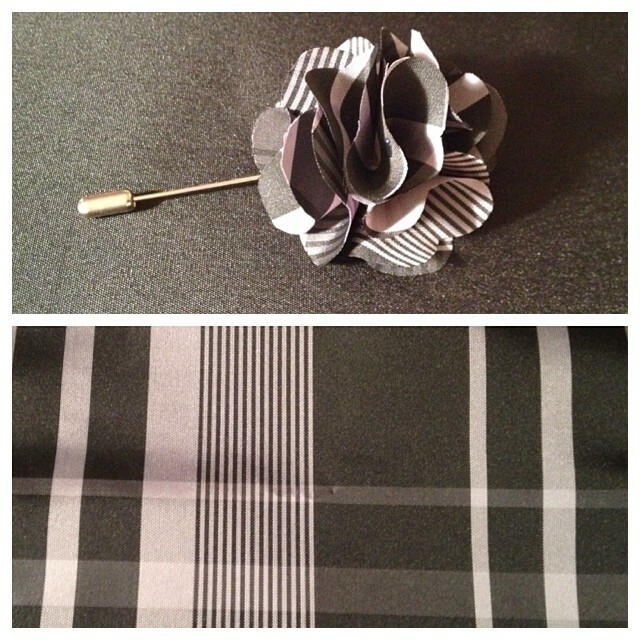 Although I don’t wear suit jackets, I will definitely be rocking one of the Finished Good’s lapel flowers. 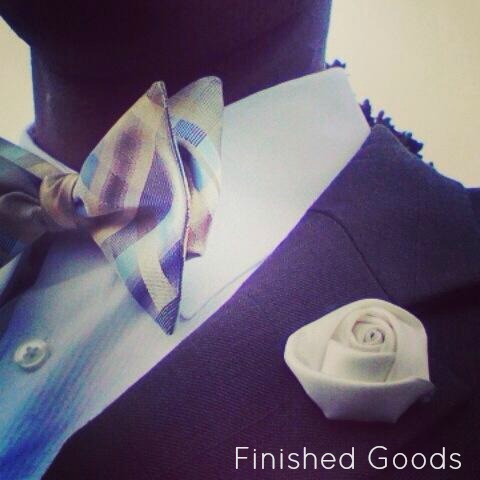 This entry was posted in Friday Features and tagged diy, finished goods, friday feature, lapel flowers, suits. It’s that time of the year again..Party season! I have 3 kids who start planning their birthday parties the day after their birthday. You can only imagine how crazy this time of the year can get. They are little mini me’s when it comes to party planning. Did I forget to tell you that their birthdays are in April, May, and July. With that said, my son has thought that he was a superhero for the longest time. At first he was obsessed with Spiderman, then Iron Man, Hulk, and now Batman. Of course I am throwing the most awesome Superhero party ever! I’ll be updating you guys with the prep for this party. Today, I’m starting with the invitation. I usually make all of my own invites. However, too much is going on. So, I headed on over to Etsy.com to find the perfect invite. I searched and searched. I personally thought that many of the invites were to generic looking. I like for my invitations to stand out. After a lot of searching, I found the perfect invite at CapturedbyJessPrints and the price was just right! lol. Now the picture in her invite is absolutely perfect. I had a vision in my head of what I wanted my son’s picture to look like. Unfortunately, I’m working with an energetic 2 year old who seriously thinks he’s a superhero. He wouldn’t stay still to save his life! 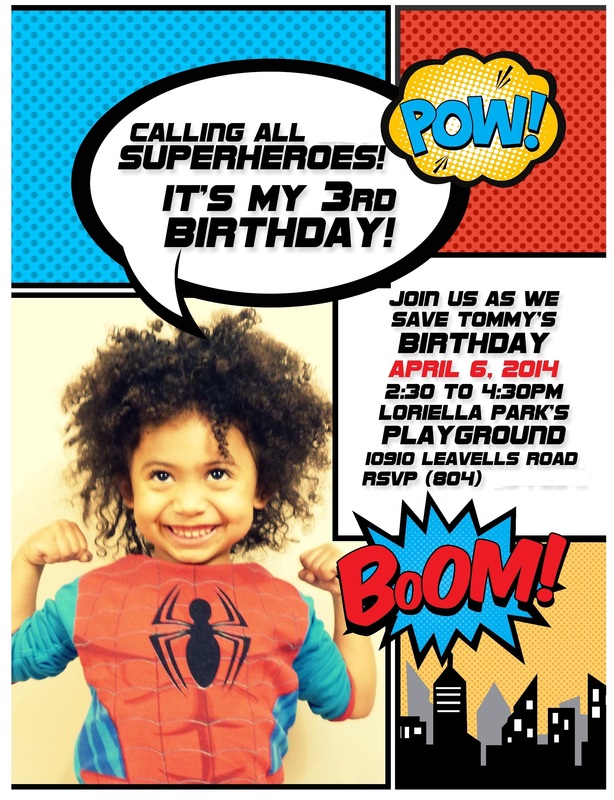 Anyway, I am very happy with the way the invitations turned out despite my wiggly, little Batman/Spiderman. 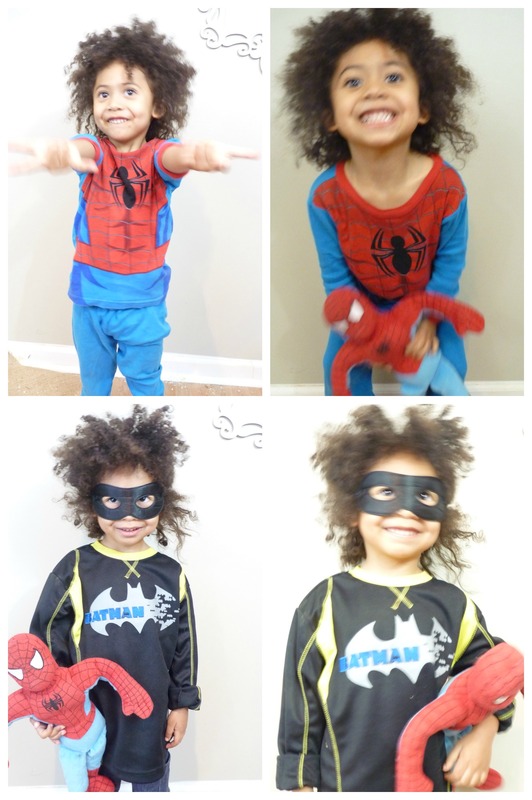 More Superhero party ideas to come! This entry was posted in Crafty Parties, Kid's Parties and tagged Batman, birthday, party, Spiderman, superhero invitations. My craft is baking and planning special events. 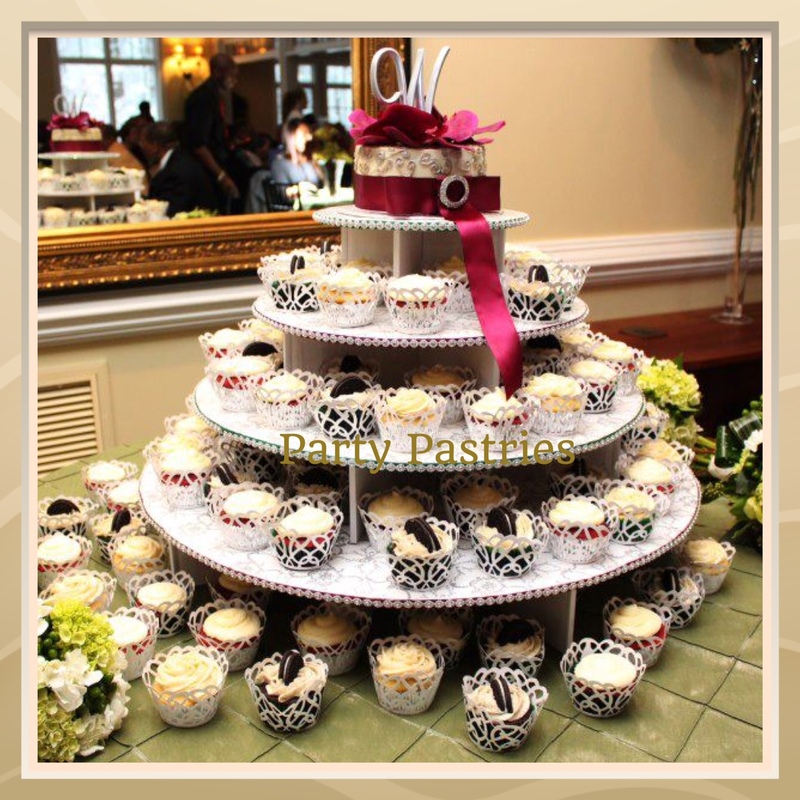 I own a baking business and event services/planning company by the name of Party Pastries. I’ve always loved to bake cakes and cookies for as long as I can remember. I officially created Party Pastries in September of 2010 when I found out that my daughter was allergic to peanuts and eggs. There are many people and places that I look to find inspiration. There are so many talented bakers out there who just blow my mind with their creations. I also find inspiration from my family and friends. From someone sending me a picture of a cool cake, cupcakes or just a simple conversation with a friend about different ways to make Party Pastries unique and set apart from everyone else. Right now I would have to say cake pops! 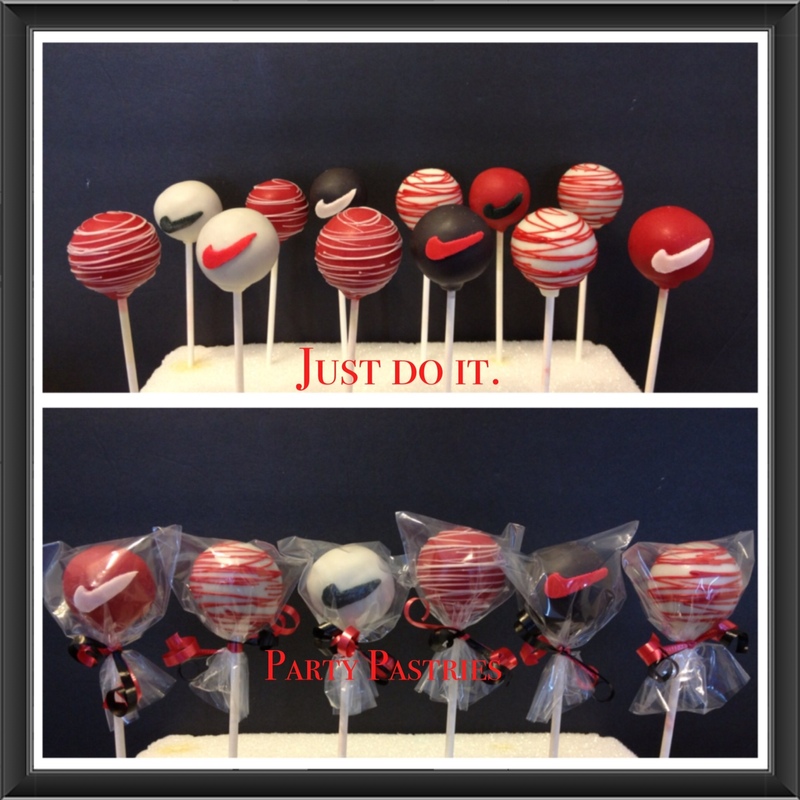 Although I specialize in a variety of baked goods, cake pops seem to be the most popular item. Cake pops are very time consuming to make with all the fine details that goes into it. However, I find that with cake pops you can make just about any design. I just love how something so small and bite size can still be a huge hit and versatile! What are your future plans for my crafts? I hope to one day own a bakery and down the line have a few of them in different areas. I’m currently in the process of launching my website. I want my customers to be able to place orders directly online from the website. If you would like to be featured o Friday Features, email me at thecraftcomplex@gmail.com! I can’t wait to hear from you. 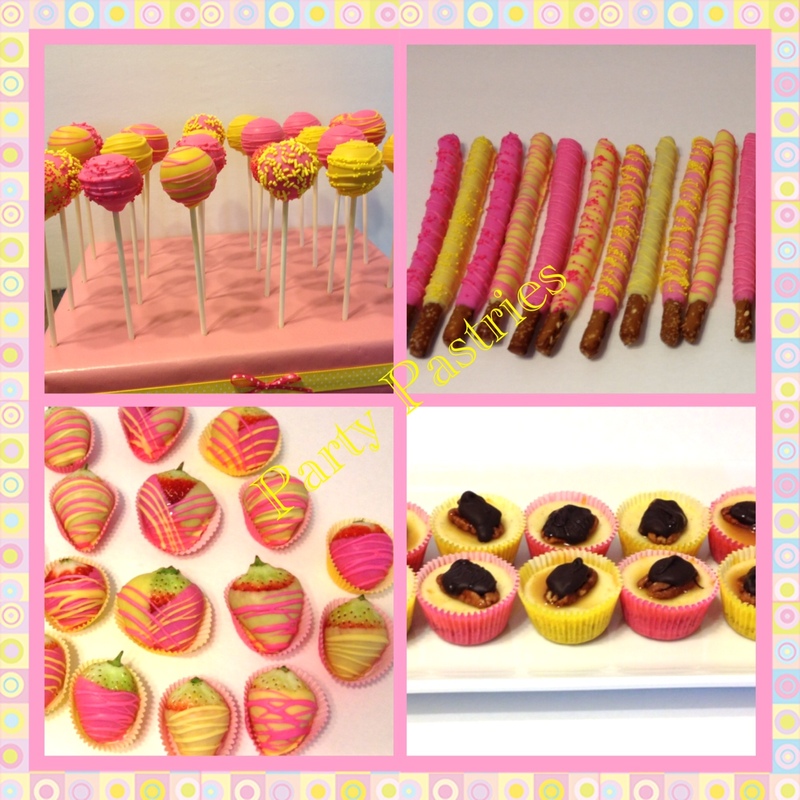 This entry was posted in Friday Features and tagged cake pops, crafts, cupcakes, friday features, party pastries. Are you ready for this??? 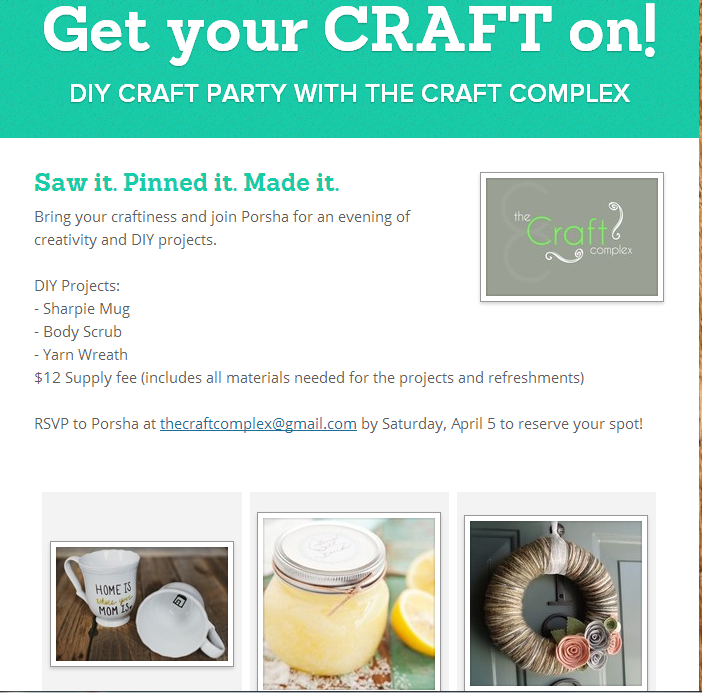 I am hosting a craft party next month! 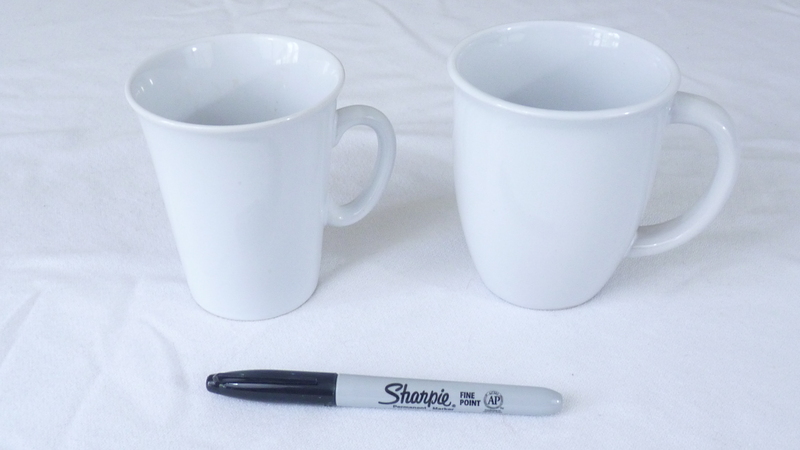 sharpie mugs – I am so excited to try decorating these. Hopefully they turn out as cute as ones that I’ve seen online. body scrub/body butter – these have been pretty popular on my Instagram and Facebook. I’m just trying to decide which scent to make. Maybe I should let my guests decide? Yarn wreaths for spring- Spring is right around the corner (next week can you believe that?). The forecast is calling for snow on Monday. I think this wreath will happily be welcomed. If you are in the Richmond, VA area and you’re interested in coming to the party, email me at thecraftcomplex@gmail.com. Oh, and have you heard about smore.com? It’s this awesome sit where you can create online flyers. They have some really neat templates that makes creating flyers super easy. Head on over there the next time you want to create an online flyer! 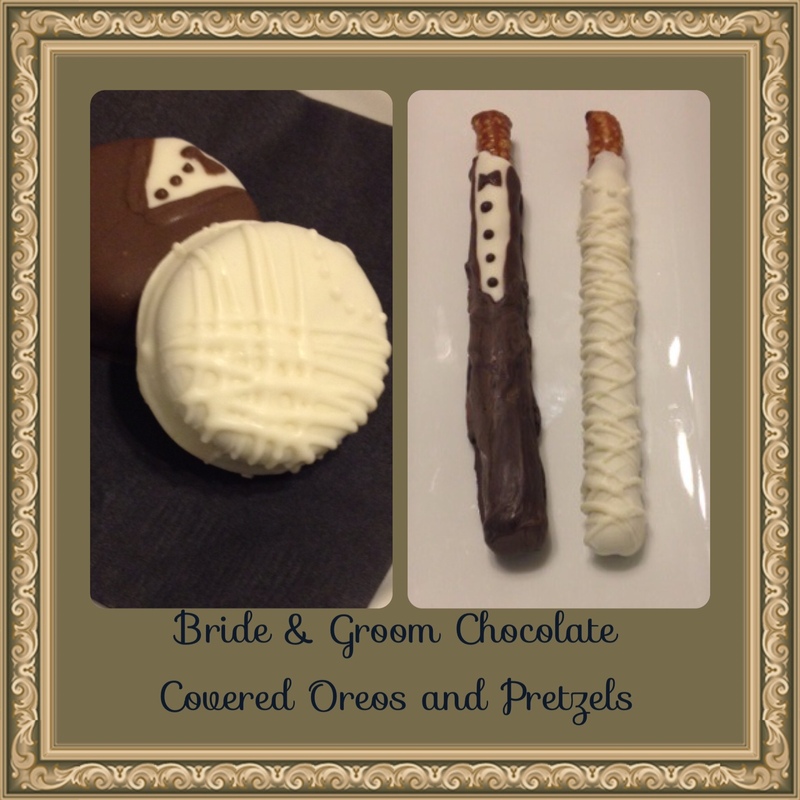 This entry was posted in Crafty Parties, DIY Projects and tagged craft party, diy, party, smore.